Memo 125: Son of a Beach! If it’s still snowing where you live, I’m really so very sorry to do this to you but…you should move. Ok, maybe not move but you should leave for a little while. And by “little while”, I mean all of the winter months! There are places in the world that are warm and have been warm for a while now. As a former Michiganian, I know how brutal the winter (“fall” and “spring”) months can be. And guess what? I moved. Yeah, I’m definitely a weather snob! Anyway, during a little weekend getaway to LA, the girls and I spent a nice breezy morning riding bikes, running people over and taking names on Venice Beach. 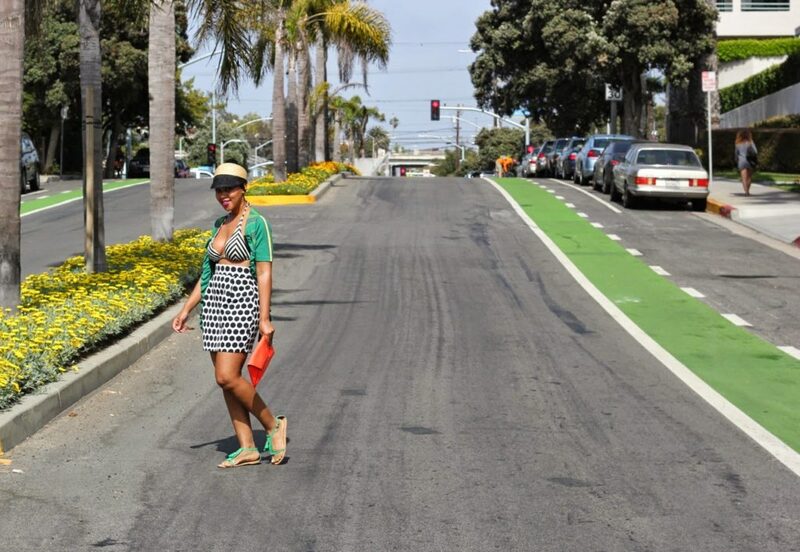 And I honestly didn’t coordinate this clash of chevron-polka dot-ruffled-striped sweetness with the bicycle. However, sometimes, when you’re not even paying attention, things just werk out! Wow, I love the relaxed vibe in this look and the combination of the different patterns.Where I live its hot all the time. super cute! your blog has restored my faith in the blogger world, everyone was starting to look the same! Such a Great look on you and the scenery is just what the doctor ordered. Summertime. . .yeah! Yep learned that lesson, moved to So. CA years ago! Cool outfit! Love, Love, Love that hat! Ughh you can do no wrong with your style, love the look! Your style is always great. I think you could use a more flattering and supportive bikini top but you're always beautiful.